Today, Golaem announces VRayGolaem for 3ds Max, a free plug-in that brings V-Ray’s production rendering power to a new set of Golaem Crowd users. Already a fixture of the VFX scene, Golaem Crowd is known for crowd simulations that can exceed 100,000 characters, all while exhibiting high amounts of diversity. 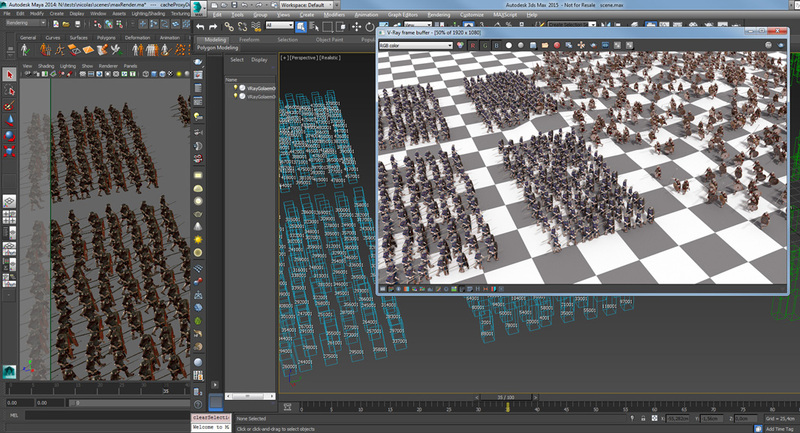 Now the same high-quality crowds that VFX and game studios create in Autodesk Maya can be rendered in 3ds Max. Co-developed with Chaos Group, VRayGolaem for 3ds Max’s rendering workflow hinges on a combination of Golaem’s proprietary simulation cache technology and V-Ray scene files. Unlike other solutions, character geometry is not exported, but recomputed from simulation cache before being sent to V-Ray. This process makes exporting incredibly fast and reduces the size of all exported files by 99%. All shaders and assets distribution can be tweaked at any time, removing the need for re-caching that can make the creation process slow and inconvenient. Designed to replicate a native V-Ray workflow, the VRayGolaem for 3ds Max plugin supports all V-Ray 3.0 features such as 3D motion blur, render elements, subdivision and more. All scenes translate as simple V-Ray proxy objects, keeping rendering speeds fast and efficient. To further simplify layout and lighting steps, VRayGolaem for 3ds Max can display the crowd characters’ bounding box in the 3ds Max viewport without slowing it down. Additionally, thanks to a proxy node, artists will be able to control every aspect of how their crowds are rendered without having to go back into Maya. We are very proud to announce that Golaem Crowd has been nominated in CGAwards 2015 Plugin Category. Please vote for us so that we can make it to the final shortlist! '"If you need crowds in your production, and you want to do it with as few hassles as possible, then Golaem is what you need. It is powerful, flexible, and does what it says on the box. Support is also excellent." Framestore will be giving at talk at Paris Images Digital Summit on Thursday 22nd at 5:15pm covering how Dracula Untold huge battle scenes were brought to life using Golaem Crowd. The Golaem team will be attending the summit, ready to answer your questions about how Golaem can help bring life to your productions. If you are still a student, ask us why Golaem is the right choice for kickstarting a student carrer, we will be happy to explain how you can find a job in crowds! Learn Golaem Crowd with fxphd GOL101 course! We are very happy to announce that the new fxphd term includes a course about Golaem Crowd! Listen to Gareth Stevenson, 3D Generalist at Union VFX, and learn everything you need to create great crowd effects! Gareth will detail every parts of the Golaem Crowd workflow: how to easily populate your scenes, create behaviors to animate any type of characters, use your own assets, render... Gareth has used Golaem Crowd for many projects, in different situations (city, audience...), and we are very happy that he now has the opportunity to share his experience with all of you. As you probably know, fxphd is an online vfx, production, post-production training program led by professionals. It offers both application and craft-based courses, online forums for feedback, and vpn software. Icing on the cake, fxphd offer an enrollment certificate code for people completing a course. Do not hesitate to share your Golaem Crowd projects and your certification number so that we can promote your profile in the new jobs section we are working on!